Una bella intervista a Louis Philippe nei panni di giornalista esperto di calcio - e perciò quale Philippe Auclair, come all'anagrafe - è da oggi disponibile on-line al sito Stretty News, parte di una serie curata da Jonathan Shrager per la gioia dei tifosi del Manchester United. 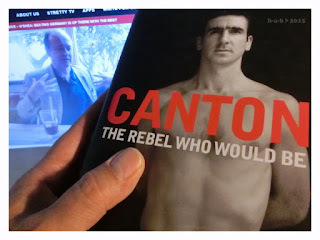 Tema della conversazione è il libro di Philippe Cantona-The Rebel Who Would Be King (Macmillan, 2009) sul celebre 'ex' Éric Cantona. Jonathan Shrager chats with esteemed French journalist and broadcaster Philippe Auclair, renowned amongst Manchester United fans for his critically-acclaimed biography on Eric Cantona. During this in-depth sit-down, Jonathan delves deep into the world of Cantona, his idiosyncrasies and eccentricities, the French media perceptions (and misconceptions) of Eric throughout his stories career, the process of compiling a comprehensive and compelling chronicle on the captivating Cantona, the intimate sources drawn upon to do so, his love affair with Manchester United, his seemingly premature exit from the beautiful game, and much much more.